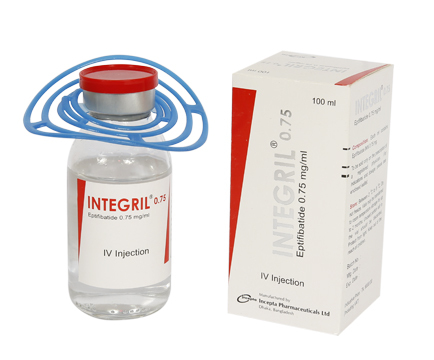 Integril 2 Injection: Each ml of sterile solution contains Eptifibatide INN 2 mg.
Integril 0.75 Injection: Each ml of sterile solution contains Eptifibatide INN 0.75 mg.
Eptifibatide is a cyclic heptapeptide containing six amino acids and one mercaptopropionyl (des-amino cysteinyl) residue. Integril binds to the platelet receptor glycoprotein (GP) IIb/IIIa of human platelets and reversibly inhibits platelet aggregation by preventing the binding of fibrinogen, von Willebrand factor, and other adhesive ligands to GP IIb/IIIa. • Patients with acute coronary syndrome (unstable angina/non-ST- segment elevation myocardial infarction), including patients who are to be managed medically and those undergoing percutaneous coronary intervention (PCI). • Patients undergoing PCI, including those undergoing intracoronary stenting. •Normal renal function: 180 μg/kg IV bolus of as soon as possible following diagnosis followed by a continuous infusion of 2 μg/kg/min. •Creatinine clearance <50 mL/min: 180 μg/kg IV bolus of as soon as possible following diagnosis followed by a continuous infusion of 1 μg/kg/min. -Infusion should continue until hospital discharge or initiation of coronary artery bypass graft surgery (CABG), up to 72 hours. -If a patient is to undergo PCI, the infusion should be continued until hospital discharge or for up to 18 to 24 hours after the procedure, whichever comes first, allowing for up to 96 hours of therapy. - Infusion should be continued until hospital discharge, or for up to 18 to 24 hours, whichever comes first. A minimum of 12 hours of infusion is recommended. - In patients who undergo CABG surgery, INTEGRILIN infusion should be discontinued prior to surgery. 1. Integril solutions should be inspected visually for particulate matter and discoloration prior to administration, whenever solution and container permit. 2. 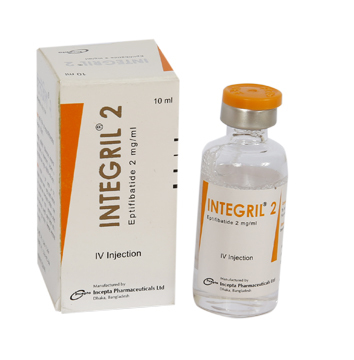 Integril may be administered in the same IV line as alteplase, atropine, dobutamine, heparin, lidocaine, meperidine, metoprolol, midazolam, morphine, nitroglycerin, or verapamil. Integril should not be administered through the same IV line as furosemide. 3. Integril may be administered in the same IV line with 0.9% NaCl or 0.9% NaCl/5% dextrose. With either vehicle, the infusion may also contain up to 60 mEq/L of KCl. 4. The bolus dose(s) of Integril should be withdrawn from the 10-mL vial into a syringe. The bolus dose(s) should be administered by IV push. 5. Immediately following the bolus dose administration, a continuous infusion of Integril should be initiated. When using an intravenous infusion pump, Integril should be administered undiluted directly from the 100 mL vial. The 100-mL vial should be spiked with a vented infusion set. Care should be taken to center the spike within the circle on the stopper top. Bleeding is the most common adverse effect. Adverse reactions include intracranial hemorrhage & stroke, thrombocytopenia, allergic reactions and hypotension. • Before infusion of Integril, the following laboratory tests should be performed to identify preexisting hemostatic abnormalities: hematocrit or hemoglobin, platelet count, serum creatinine, and PT/aPTT. In patients undergoing PCI, the activated clotting time (ACT) should also be measured. Pregnancy: Category B. Animal studies revealed no evidence of harm to the fetus due to Integril. There are, however, no adequate and well-controlled studies in pregnant women with Integril. Lactating Mothers: It is not known whether Integril is excreted in human milk. Because many drugs are excreted in human milk, caution should be exercised when Integril is administered to a nursing mother. Safety and effectiveness of Integril in pediatric patients have not been studied.